Get ready for summer! 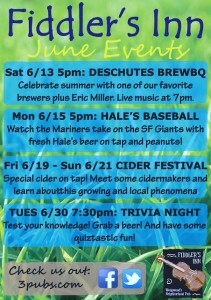 The season of events begins in June at Fiddler’s Inn, 9219 35th Ave NE. 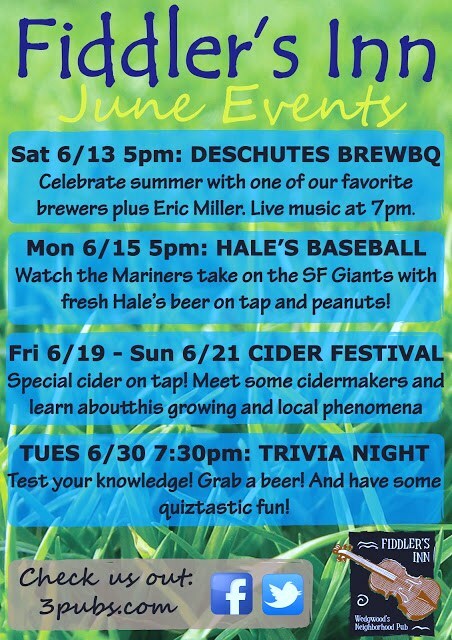 In June there will be barbecue and live music on the outdoor patio on a Saturday night, then tune in to Monday Night Baseball to watch the Seattle Mariners take on the San Francisco Giants. How about a Cider Festival, or Trivia Night? Kick-start your summer with music and entertainment at the Fid, Wedgwood’s neighborhood pub.